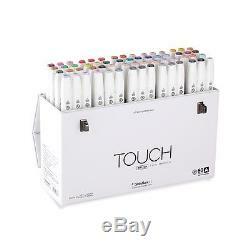 ShinHan Art TOUCH TWIN 60 BRUSH MARKER SET [A] Colors in this set. 0 Colorless Blender, 120 Black, B143, B63, BR101, BR103, BR91, BR92, BR97, CG1, CG3, CG5, CG7, CG9, G46, G54, GY47, GY48, P145, P146, P147, P81, PB144, PB69, PB71, PB73, PB76, PB77, R10, R11, R131, R135, R136, R139, R14, R140, R2, R28, RP137, RP138, RP6, RP87, RP9, WG1, WG3, WG5, WG7, WG9, Y34, Y35, Y36, Y41, Y49, YR132, YR133, YR21, YR23, YR26, YR27, YR29. Get the TOUCH of real brush strokes with a marker. The innovative and durable design of the nibs ensures they will not lose their firmness over time. Optimum ink flow and drying rates allow for seamless execution of even the most detailed artwork. Refillable ink and replacement nibs add to the longevity of the TOUCH TWIN Brush Markers. 100% compatible with Copic Markers! The item "ShinHan TOUCH TWIN 60 BRUSH MARKER SET A" is in sale since Saturday, March 05, 2016. This item is in the category "Crafts\Art Supplies\Drawing\Pens & Markers". The seller is "otakufuel" and is located in Sunland, California. This item can be shipped to United States, to Canada.